Happy 2014! What a whirlwind week. The holidays went by so quickly, as they always do! I spent nearly a week in Columbus with my family, which was really nice. And…I got engaged! My boyfriend, Ty, proposed to me after we went out to dinner for our 2 year anniversary. He totally surprised me by driving to Sage’s Apple Farm in Chardon, where we met in August 2011. It’s still sinking in, but I am thrilled. eeee! Now… let’s talk about food. Italian food. Specifically: meatballs! I have a small series of Italian-centric posts for you over the next week, starting with this staple recipe: Castelli Family Meatballs! This recipe has been in my extended Italian family for a long time. Whenever I have the urge to make this recipe, I usually double it and roll a variety of sizes–large to eat with pasta, small to eat in soup, etc. They freeze really well. 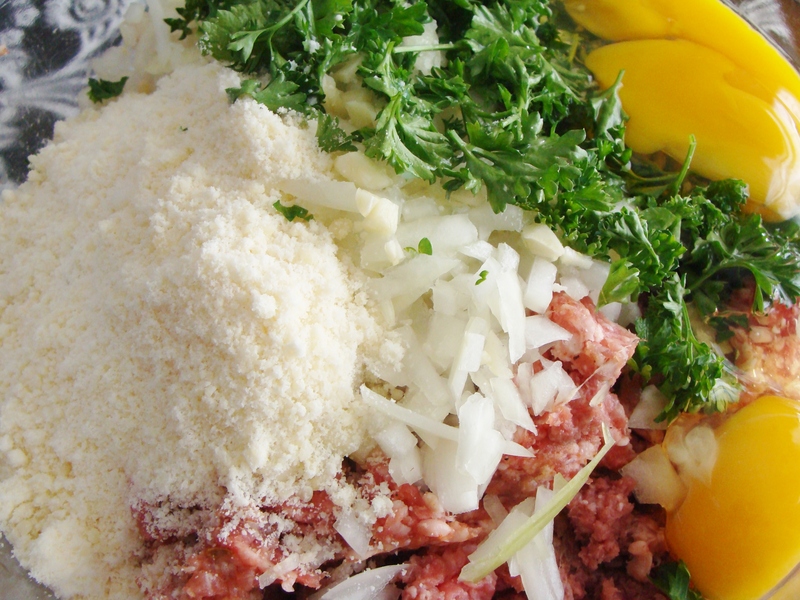 This recipe calls for a 2.5 pound mixture of meat–equal parts ground beef, ground veal, and ground pork. Basically, just shy of a pound of each. I used Italian pork sausage in place of ground pork. It also calls for 1 onion, minced–feel free to substitute a tablespoon or so of dry minced onion if you feel weird about pieces of cooked onion in the meat mixture. It may look weird but I promise you it tastes delicious! Basically? This is all about putting a bunch of ingredients in a bowl and mixing them up! Easy! 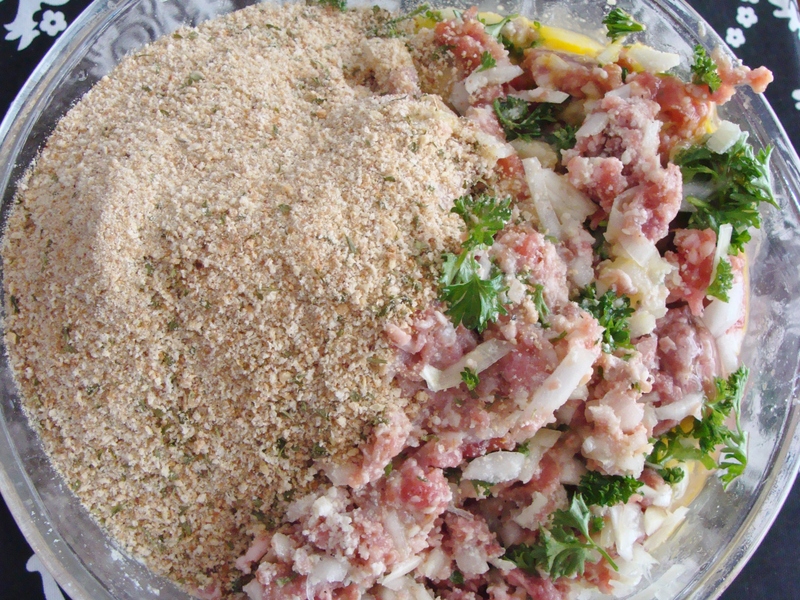 Start by adding your ground beef, veal, and pork to the bowl, and mix the meat well, until blended. 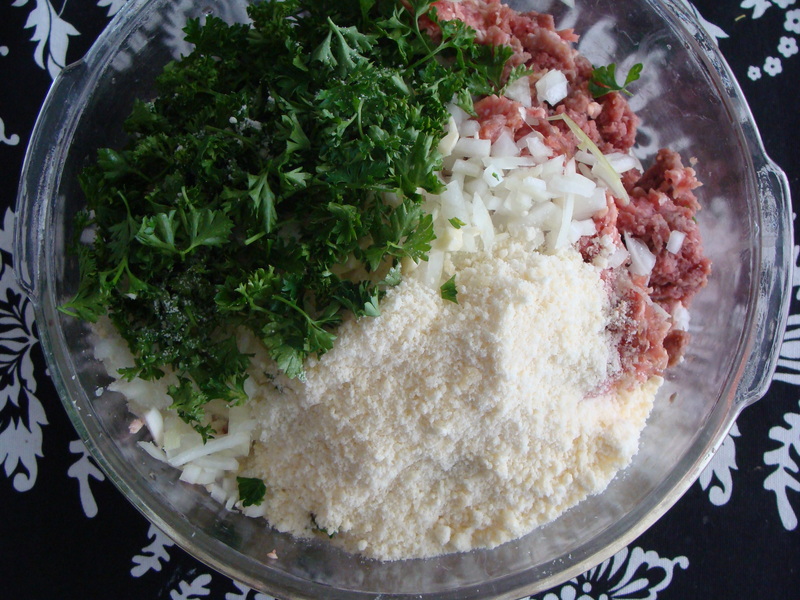 Then add the minced onions, chopped garlic, grated cheese, chopped parsley, eggs, milk, and bread crumbs! I added the breadcrumbs last. 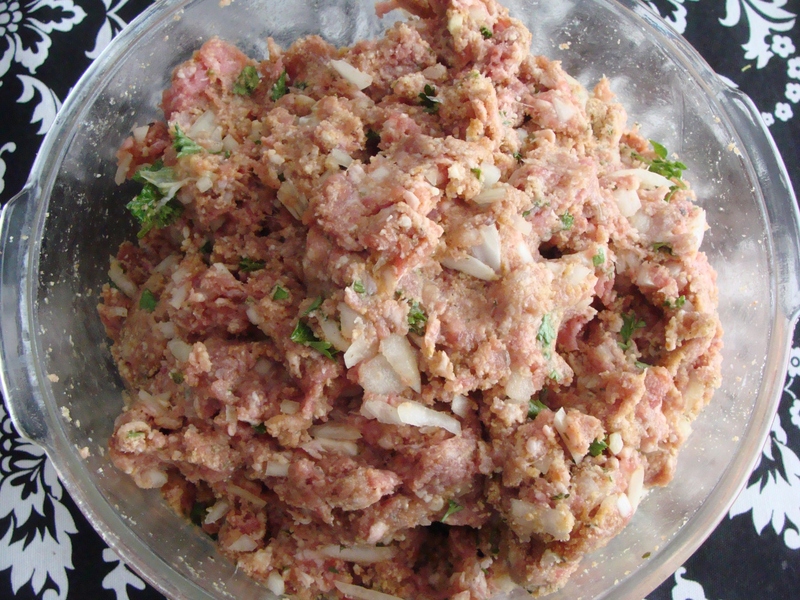 Once the meatball mixture is totally ready, it needs to rest for a half hour (or more) in the fridge. 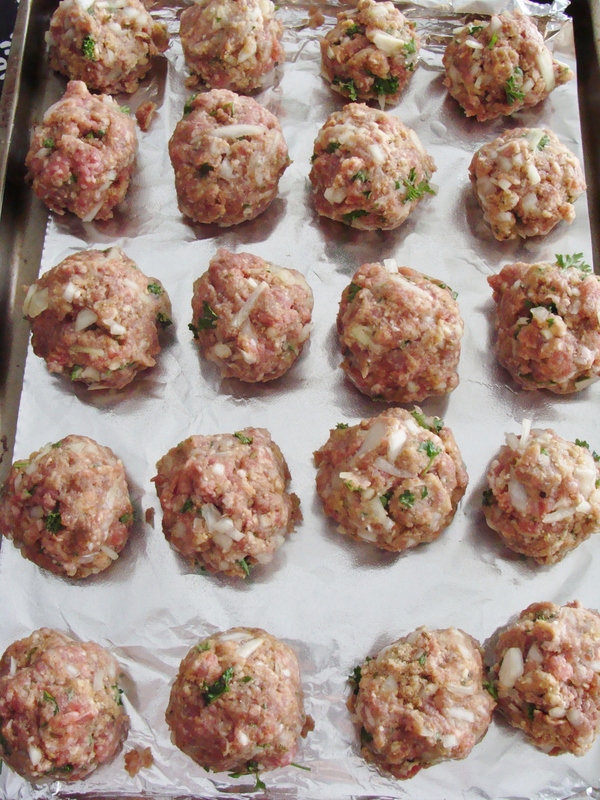 After the meatball mixture has rested, it’s time to shape the meatballs. Line 1 large or 2 small baking sheets with foil. Spray the foil with Pam or other nonstick baking spray. This really helps prevent the meatballs from sticking to the foil. Use an ice cream scooper or your hands to roll the balls. 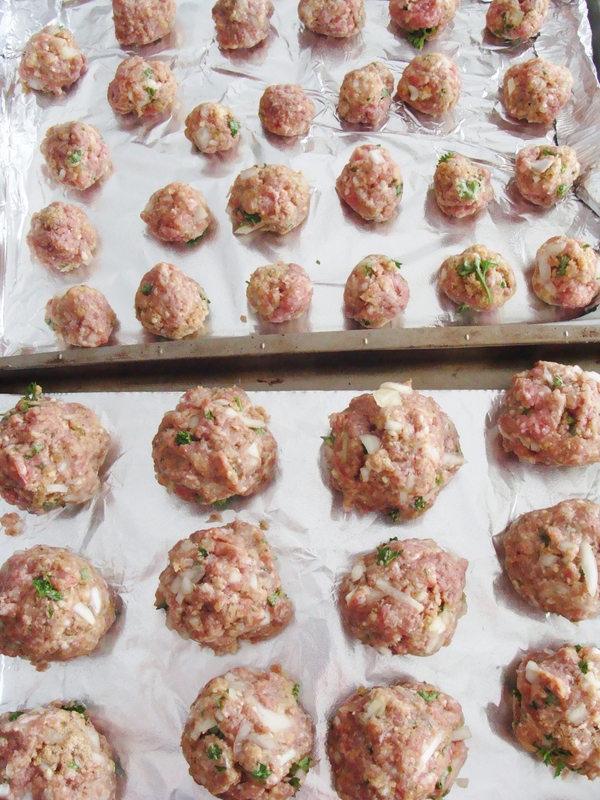 I did a tray of larger balls, and a tray of smaller ones to freeze for soups. 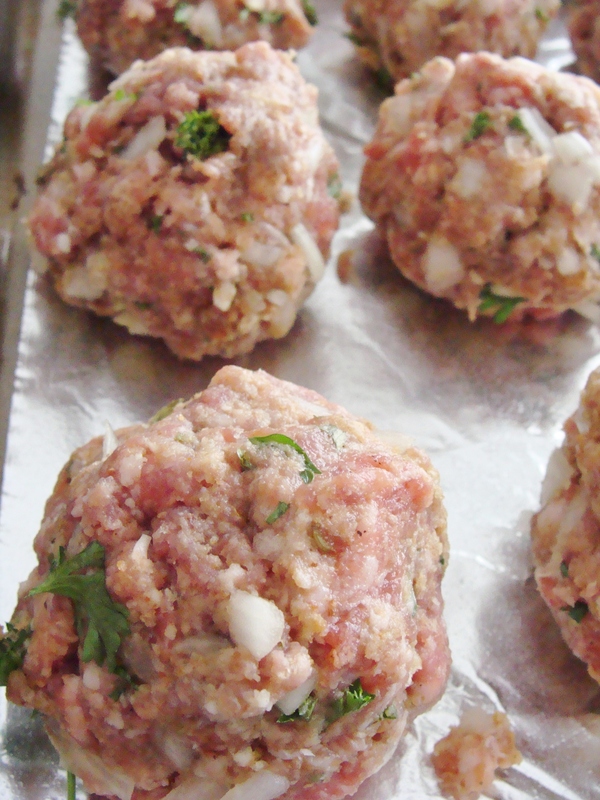 Bake the meatballs at 350 degrees for 30 minutes. These are the baked meatballs fresh from the oven. For New Year’s Day dinner, I simmered these meatballs in homemade tomato sauce–my Mom’s recipe! That’s coming up next. 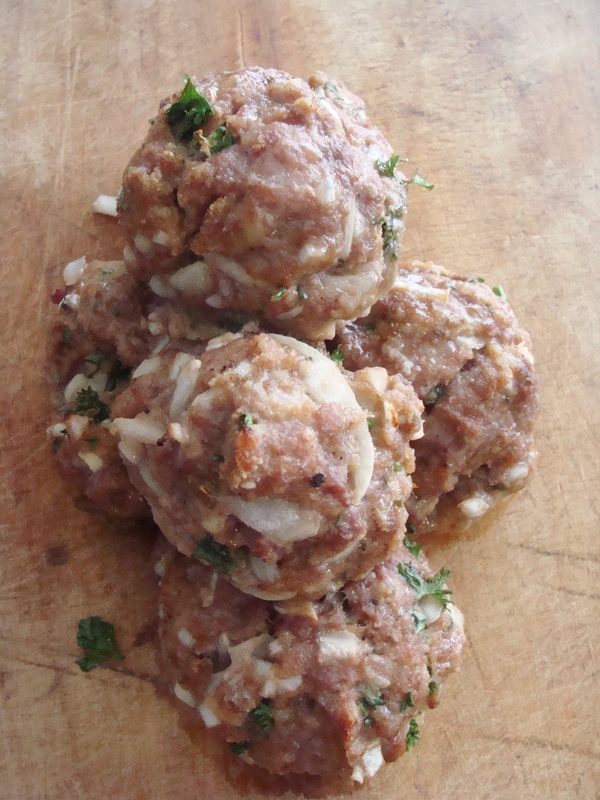 § 5 Responses to Castelli Family Meatballs. Do I add the tablespoon of olive oil to the meat mixture? what are the ingredients of the italion seasoned breadcrumbs? I made these last weekend and they were the best !!! « Italian meatballs in homemade tomato sauce. You are currently reading Castelli Family Meatballs. at The Cheesy Kitchen.